Toyota will sell only a relative handful of the Rav4 EV over the next three years. NEW YORK (CNNMoney) -- Toyota unveiled its new electric Rav4 crossover SUV at an event in Los Angeles Monday but said it will be available only in four California cities for the time being. Toyota (TM) plans to sell only 2,600 of them over the next three years, the automaker said. They will cost $49,800 each, Toyota said, but will be richly equipped with features like heated seats and an eight inch touch-sensitive computer screen. The price does not factor in a $7,500 federal tax credit for purchasing a plug-in vehicle. It also doesn't include a $2,500 state tax credit. The Rav4 EV will have a driving range of approximately 100 miles, Toyota said, with an expected 6 hour charge time on a 240 volt charger. "It's designed for consumers who prioritize the environment and appreciate performance. We look forward to seeing how the market responds," said Bob Carter, group vice president and general manager of Toyota Motors Sales U.S.A.'s Toyota division. 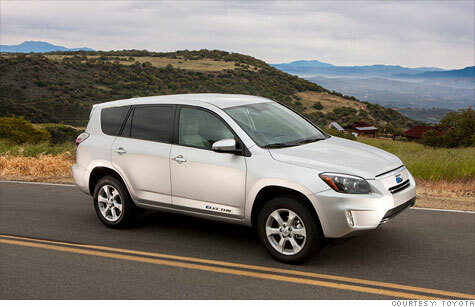 The Rav4 EV will help Toyota meet electric vehicle requirements in the state of California. Automakers have to sell a certain number of "zero emission" vehicles in order to be allowed to continue selling vehicles in the state. Toyota's plans for the Rav4 EV were revealed in the summer of 2010, shortly after it was announced that Toyota would invest $50 million in Tesla Motors and that Tesla would build its next vehicles in a former Toyota factory in California. The front-wheel-drive Rav4 EV will have two different drive modes. In its normal mode, the SUV will go from zero to 60 miles per hour in as little as 8.6 seconds and will have a top speed of 85 miles per hour, according to Toyota. In "Sport" mode it will be able to get to 60 mph in 7 seconds and will have a top speed of 100 mph. Toyota has long been cautious in its approach to purely electric vehicles in the belief that the market for such vehicles is limited because of their high cost and limited driving ranges. The Japanese automaker has been much more aggressive in pursuing gasoline-electric hybrid technology. Toyota recently began selling a new Prius plug-in car but that vehicle can travel only about 11 miles before it begins burning gasoline. Toyota also plans to market a purely electric car called the Scion iQ EV which will have a range of less than 50 miles. That car won't be sold directly to the public, however, but will be used in car-sharing programs in big cities. Toyota joins a growing list of automakers selling at least some plug-in vehicles. Today, the largest-selling plug-in cars are the Nissan (NSANY) Leaf and General Motors' (GM, Fortune 500) Chevrolet Volt, a so-called extended range plug-in car. Even those vehicles, however, sell in small numbers. GM sold just under 2,300 Volts in March, which was that vehicle's best sales month ever.